Of all the happy things life throws in my direction, a major plumbing issue doesn't rank. We found water leaking in our basement. The culprit, both bathtub drains upstairs. But where was the leak? Directly behind my beautifully tiled basement bathtub. Brent had called our fix-it man and told him to wedge into the window and snake a camera down to find the problem. Hence the mid-day prowler. It could have been worse. 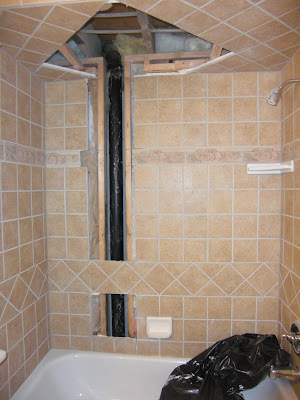 Originally we thought we would have to retile the entire bathroom. Thanks to some careful, albeit very expensive, work, we saved the tile and the bathroom and food storage are as good as new. One more reason to keep the rainy day fund flush.